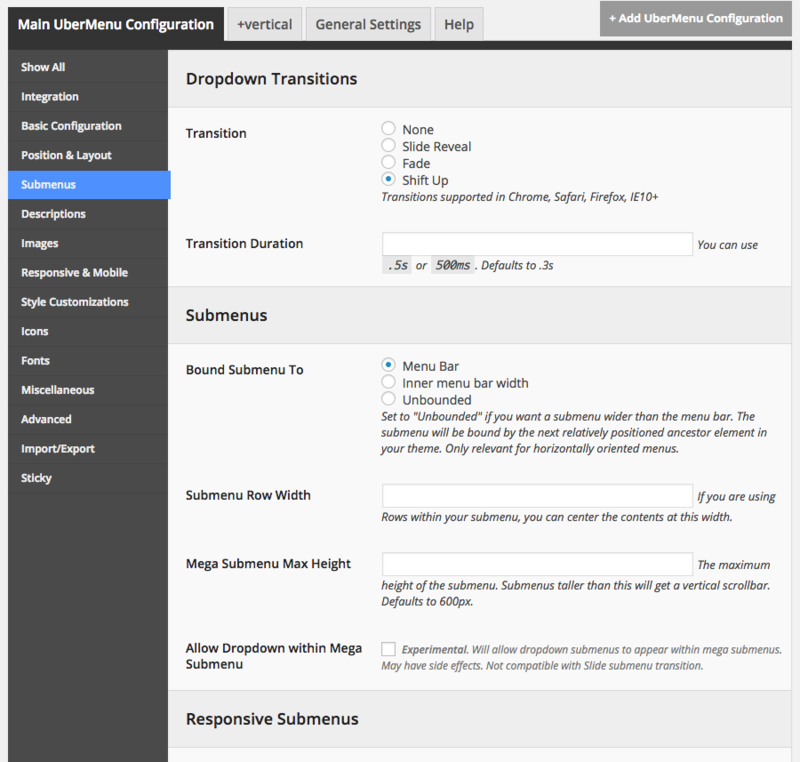 The majority of submenu configuration is done through the individual menu item submenu settings, but there are a few settings to be configured in the Control Panel. By default, the submenu will not be able to exceed the bounds of your menu bar. That means that the left edge of the submenu can’t be any further left than the left edge of the menu bar, and the right edge of the submenu can’t be any further right than the right edge of the submenu. All submenus in a menu must be bound to the same extents. This submenu is bounded to its menu bar. The submenu cannot be any wider than the width created by the top level items. The submenu is bounded to the inner menu bar. Mostly useful when centering the inner menu bar. The extents to which the menu can expand is dictated by the theme, and is not something that UberMenu can control. This setting sets the width of a Row menu item in your submenu. Generally you would want to set this to the width of your content, and likely matches the Inner Menu Bar Width if you are using that setting as well. This value is used to center the submenu contents properly. If you have a lot of content in your submenus, you may want to adjust the maximum height. The default is 600px. Once the height of your content exceeds this max height, a scrollbar will appear. This allows content that otherwise might be inaccessible (off the screen) to be accessed.